United State photographer Brian McCarty wants you to see the horrors of war, but through the eyes of a child. There is no blood or mangled bodies. Instead, there are pink dolls and blue tanks. A bird from a video game represents bombs falling from the sky. An elephant symbolises a lost sibling. McCarty's most recent work was set in Mosul where thousands of civilians where caught up in the fight to oust Islamic State. Social workers say children who witnessed the violence will suffer trauma for years. "I harness that to tell their stories and give it to an audience that normally maybe wouldn’t look," said McCarty, 43. McCarty describes it as "reality with a dose of sugar". "It is from that childhood innocence, that very pure place of telling the story but not telling the story, and that is what is so powerful," he said. "People will connect to this. Especially for Western audiences where it is so easy to cast people in war zones ... as 'the others'," McCarty said in an interview in Beirut. "It gets past that because these are just toys. They are just plastic totems of real people." A recurring image in the children's drawings is the yellow "Angry Bird", a deadly character in a popular video game. For the children, it came to represent bombs. McCarty said it was "just one step from the reality". McCarty's depicted that with a doll dressed in a headscarf and robe being pelted with stones. A shadow of a man in the foreground represents her executioner. "I did this entire set up in the old city, the smell of death everywhere. When we were done we realized there were a skull and a body a metre away, the beard still intact." 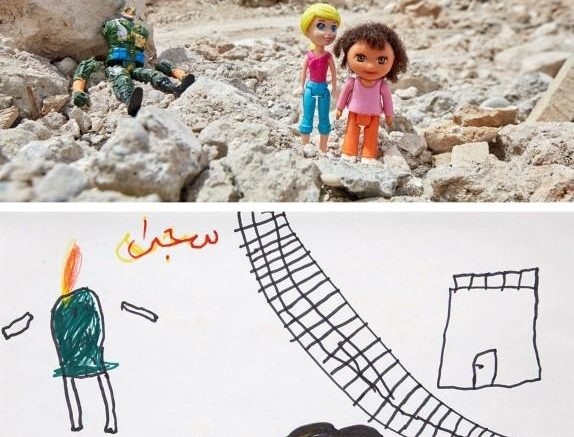 "I did this toy photo next to a dead ISIS fighter still in the rubble. That is the weird, bizarre ... the reality of the project." "I went into this project from a very academic, artistic point of view and all of that of went out the window when I saw a little girl colouring pools of blood for the first time."